The full moon is rising and this creature of the night is coming out to scare of some unsuspecting Trick or Treater! Baring his sharp teeth and claws, this Werewolf is ready to pounce! Don't make this Werewolf angry or you'll be his next victim! A decorative alternative to adjustable plastic hangers, allowing you to hang a variety of wreath sizes on a multitude of door heights. Sturdy metal construction holds even heavy wreaths. Easy to adjust height with proprietary slide mechanism. Barking up some unexpected surprises, the Skeleton French Bulldog is a fun and frightening piece for any boneyard collection. Watch out as he tries to take a chomp at unsuspecting passers-by. Glowing red eyes and growls will thrill anyone who wants to give Fido a treat. 36-inch LED-Lit Animated Werewolf Halloween Decoration The full moon is rising and this creature of the night is coming out to scare of some unsuspecting Trick or Treater! Baring his sharp teeth and claws, this Werewolf is ready to pounce! Don't make this Werewolf angry or you'll be his next victim! 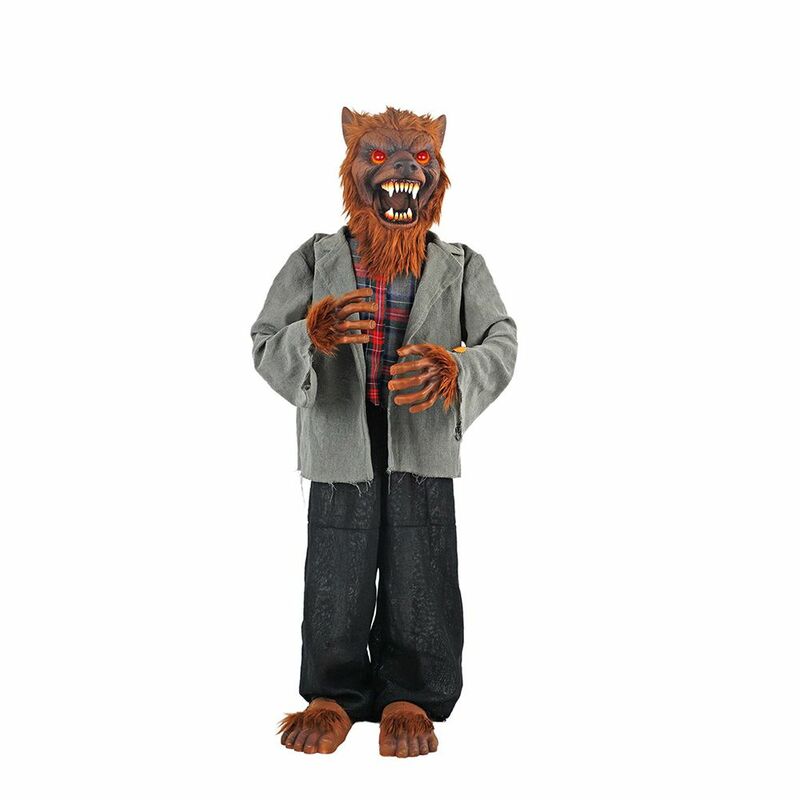 36-inch LED-Lit Animated Werewolf Halloween Decoration is rated 4.2 out of 5 by 42. Rated 5 out of 5 by smarty from I would have like to see it have a fuller body instead of just a pole but otherwise than that its... I would have like to see it have a fuller body instead of just a pole but otherwise than that its good. Rated 1 out of 5 by Janet from Stopped working after a week?... Stopped working after a week? Rated 5 out of 5 by Mike from This was a great addition to our Halloween decor. We had it on our front porch and it would activ... This was a great addition to our Halloween decor. We had it on our front porch and it would activate regularly when someone came by and spoke or made some other sound. It worked perfectly and even has posable arms. Rated 2 out of 5 by Boo from This is a cute but was somewhat disappointed as it took a great deal of noise to activate the eye... This is a cute but was somewhat disappointed as it took a great deal of noise to activate the eyes and sound. Looks great in a display when activated.